"They can send me away, stop me seeing you, make me kiss floors and burn every word I write, but they can't tell me what to think, and they can't stop me writing the journal in my head." The 1960s were a time of upheaval for everyone, but the upheaval was a bit more painful in the more conservative institutions. Few institutions were quite as conservative as the Catholic Church, which had remained relatively unaltered for centuries. But with the reforms of the Vatican II Council (1962-1965), that all began to change. This Australian-Irish television miniseries takes a look at these changes as they affected the women of an Australian convent when they had to come to terms with the modern world. The first episode is primarily devoted to Diane (Josephine Byrnes), as she decides to cancel her upcoming marriage and instead enter the convent of Santo Spirito in 1962 Sydney. Taking the name Sister Catherine, she and another postulant, Sister Paul (Lisa Hensley) run afoul of the domineering Sister Agnes (Brenda Fricker) and try the patience of Mother Ambrose (Sandy Gore). Sister Catherine has severe problems with the medieval attitudes of the Church, especially in the form of Anselm and Aquinas, but her brand of independent thought is becoming more welcome under the new Vatican II rulings. 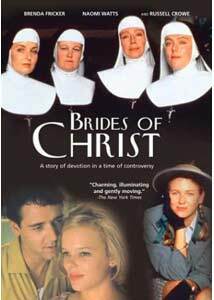 Episode 2 turns its attention towards the girls of the boarding school operated by the nuns, specifically Frances Heffernan (Naomi Watts in a very early starring role). Her friends Rosemary (Kym Wilson) and Bridget (Melissa Thomas) struggle with the discipline of the school and their own budding sexuality. The third episode focuses on Mother Ambrose and her own feelings as the convent begins to liberalize, discarding the full habit for a more reformed costume, with temptation put before her in the form of a new lay teacher, Ian McGregor (Philip Quast). The fourth outing deals with Rosemary's rebelliousness and her affection for Bridget's older brother Dominic (Russell Crowe), expressing her discontent through promiscuity. Sister Paul decides to leave the convent in the fifth episode, having fallen in love with Jack Delahunty (Simon Burke), who has left the priesthood. But she finds that the outside world is more difficult than she anticipated. The final episode finds Sister Catherine and Frances struggling with the notorious birth control encyclical Humane Vitae. The miniseries posits that all the forward-looking reforms of Vatican II were made hollow through the encyclical, which did more harm than good. Although Sister Catherine is more than critical of the Church and its hidebound nature, the miniseries nonetheless takes a sympathetic look to all of the women of the convent, regardless of their attitudes. It would have been easy to make Sister Agnes a caricature, but in a few moments she's allowed to display concern for others that makes her humane and caring. This isn't a silly or trivial look at such a life, as in The Trouble with Angels during the same period. At the same time, the most sympathetic figures display human failings and weaknesses that keep them nicely grounded; Mother Ambrose toys with a secular life herself, Sister Catherine has moments of both self-loathing and egocentricity, and Sister Paul vacillates in the best method of her service. The cast is quite exceptional, with the novices displaying a credible onscreen maturation over the time period of 1962-1968. Oscar-winner Brenda Fricker makes for a classic nun, and Sandy Gore gives a warmth and intelligence to Mother Ambrose. Naomi Watts is excellent, as is Kym Wilson. Even though the series is hardly action-packed, it deals intelligently with issues of faith and the modern world in a complex and deep manner without making either side seem ridiculous. As Mel Gibson's latest adventures have made apparent, a segment of society would just as soon return the Catholic Church to its pre-Vatican ways of doing business. This miniseries is thus timely in showing the transition and the difficulties that came with it in a sensitive and moving manner. Image Transfer Review: The film has a fair amount of speckling for such a recent picture. Significant edge enhancement helps give the full-frame picture a rather digital look. However, it does have excellent color, with good detail and acceptable black levels. There are some dupey looking shots in the sixth episode, but that seems to be a defect of the source materials. The heavy grain is well-rendered and does not look sparkly. On the whole, this is a big improvement for Wellspring, which had developed a reputation for poor transfers. Audio Transfer Review: The 2.0 English mono sounds fine, with moderate hiss and noise audible in the background. There is a fairly good bass and presence to Mario Millo's score. Dialogue is almost always clear, despite the Australian and Irish accents. Extras Review: The disc is fairly light on extras. There are three-screen bios of the principal stars, and a short essay on the reforms of Vatican II (though there's little in the latter that can't be gleaned from a careful viewing). The chaptering is thorough. An excellent look at the evolution of the Church in the 1960s, with a first-rate cast. The transfer's acceptable, but there's little in the way of extras.